League of Legends (LoL) is a free multiplayer online battle arena video game developed and published by Riot Games for Microsoft Windows, inspired by the popular Defense of the Ancients (DoTa) map for Warcraft III. Where can I download LoL? 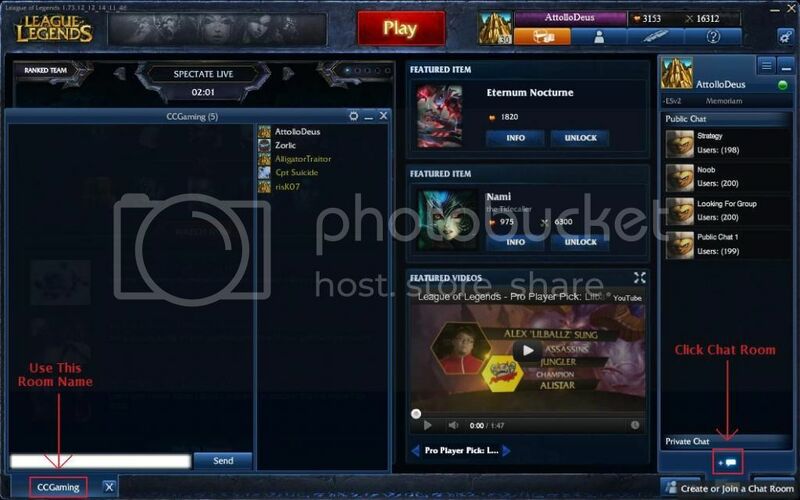 How can I access the CCGaming chatroom in League? Click on the Chat room button on the bottom of the screen, then click the create/Join channel. Then enter CCGaming then hit enter. Does the Christian Crew have a gaming night for League of Legends? The Christian Crew holds a League of Legends game night on Saturdays at 6pm Pacific/9pm Eastern. We usually meet up in TeamSpeak at 5:50pm Pacific to group up. Who in CC plays League of Legends and where can I post my in game name? Can anyone play League with CCgaming? We just ask that when in TS or in group with CC members, you respect our choice to avoid bad language and bad sportsmanship. We try to keep our game play as family friendly and fun as possible. Have questions or comments and need to contact someone? You can contact any Leader http://ccgaming.com/about/leaders/ or the division leader http://forums.ccgaming.com/memberlist.php?mode=viewprofile&u=262Suggestions are always welcome.